Fiery Breath: Exhale a flaming blast to enemies in front of you, dealing 1537 Flame Damage and an additional [5413 / 5473 / 5527 / 5596] Flame Damage over 8 seconds. Noxious Breath: Cost: 2295 Stamina. Exhale a corrosive blast to enemies in front of you, dealing [1535 / 1552 / 1569 / 1585] Poison Damage and an additional 5588 Poison Damage over 8 seconds. Afflicts enemies with Major Fracture, reducing their Physical Resistance by 5280. Engulfing Flames: Exhale a flaming blast to enemies in front of you, dealing 1537 Flame Damage and an additional 5603 Flame Damage over 8 seconds. Affected enemies take [7 / 8 / 9 / 10]% more damage from all Fire Damage attacks. Fiery Breath deals Fire Damage to enemies within a 10 meter radius in front of you, and applies fire damage over time. 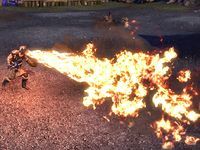 Noxious Breath changes the cost to use Stamina and the damage from fire to poison, as well as reducing your targets' Physical Resistance. Or you can choose Engulfing Flames, which will increase the target's vulnerability to other flame attacks, either from you or other players. The Noxious Breath morph was added in Update 10, replacing Burning Breath, which dealt Flame Damage instead of Poison Damage. Engulfing Flames is a recommended morph for the Inferno Dragon build, while Noxious Breath is recommended for Venomous Dragon. Burning Breath: Fixed an issue where this ability was doing less damage than intended. Engulfing Flames: The tooltip for this ability now properly states that it deals increased damage per rank. Burning Breath: The armor reduction debuff from this ability will no longer stack. Fixed an issue where Burning Breath IV wasn't dealing damage over time as it should. Increased the damage over time effect applied to all ranks and morphs by approximately 30%. Fiery Breath and its morph Engulfing Flames are now mitigated by your target's Direct Damage and Resist statistics. Fixed an issue where the morphs of Fiery Breath were dealing their damage over time instantly, instead of waiting 2 seconds like the base ability. The bonus damage an enemy takes from fire, applied by Engulfing Flames, will now properly factor into the damage from the first tick. Burning Breath: This ability will now scale off of stamina and weapon power, and is mitigated by your target's armor. This ability now applies the Major Fracture debuff to your target. Fixed an issue where the fire graphic effect wasn't applying to enemies for Ranks II-IV of this ability. Burning Breath: Fixed an issue where the Major Fracture debuff applied by this ability was shorter than the duration of the damage over time effect. Burning Breath: Renamed this morph to Noxious Breath. In addition, this morph now deals Poison Damage instead of Flame Damage. Noxious Breath: This morph now has a new icon.